South Florida Filmmaker | \ Blog \ Watch the Film: "V.A.C.C. Camp: Camp Can-Do"
Watch the Film: "V.A.C.C. Camp: Camp Can-Do"
After its world premier to a packed house at the Fort Lauderdale International Film Festival, and screenings at the Sunscreen Film Festival (voted one of the Top 25 "Coolest Film Festivals" by MovieMaker Magazine) and the ReelHeART International Film Festival in Toronto (where it took home the 3rd Place Prize in the Feature Documentary Category), allow me to present you with my latest full-length documentary film, "V.A.C.C. Camp: Camp Can-Do". 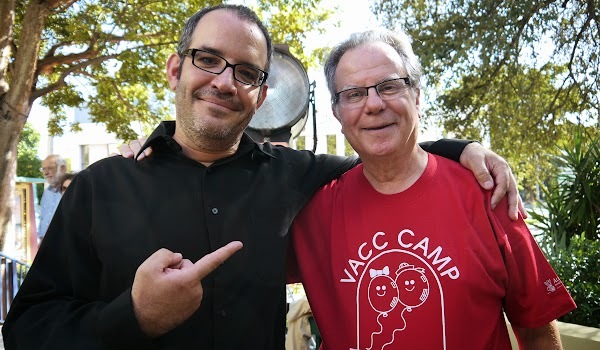 Filmed in the Spring of 2011 right here in Miami, the film documents the 25th anniversary year of the V.A.C.C. Camp, a free week-long overnight camp for ventilation assisted children (children needing a tracheostomy ventilator, C-PAP, BiPAP, or oxygen to support breathing) hosted each spring in Miami by Miami Children's Hospital. Overnight campers and their families come from throughout the United States and internationally to socialize with peers and enjoy activities not readily accessible to technology dependent children. South Florida families and youngsters from local residential care facilities join in as day campers. "V.A.C.C. Camp: Camp Can-Do" depicts the many challenges these children and their families face on a daily basis as well as the life-changing impact these same children have on the many young volunteers (and medical staff) who give up their Spring Break each year (in South Florida!) to be a part of this truly amazing camp. It's a film that reminds us how fragile and precious life is; to not take it for granted. It also teaches us the many lessons we can learn from those who "appear" less fortunate than many of us. I wrote about my experience at the camp upon completion of filming - you can read the post HERE. Since the 2011 documentary film taping, I've returned every year (now armed with HD cameras) and have produced a couple of short videos for the camp. Here's one I shot during "Pool Day" at the camp in 2012 - you can watch it HERE and you can also view a set of photographs I shot that day on flickr. I returned again in 2013 and shot a day with the campers and the good folks from Therapy Dogs, Inc., who have been bringing their amazing dogs to this amazing camp going on 15 years. You can watch the short video HERE as well as another set of photographs I shot on flickr. Sadly, since the taping of this documentary film, two of the campers featured in the film, Tyler and Amy, have passed away. It's a sobering reminder of the life-expectancy of these campers. I was asked to record the funeral services for Tyler which took place at Providence Road Church in Miami. You can see the impact these kids make in the lives of others in this short video I produced. Oh, and I'm happy to announce that V.A.C.C. Camp will be kicking off its 28th year this Spring in Miami with a brand new full-time volunteer - my 16 year-old daughter Miranda. And yes, I'll be back to produce another short video this year. Visit VaccCamp.com if you would like more information or to support this truly life-changing camp. You can also like them on facebook (I know they'll appreciate that! ).